Your kitchen can undoubtedly be your home’s most valuable asset, and given the current trend of open plan living, when it comes to creating your perfect kitchen, it’s worth investing the time and money to make it something special. One simple way to make your kitchen stand out from the rest is your choice of splashback. However, with so many choices out there, how do you decide what style and material to go for? Here we identify some of the best options to make your splashback a standout part of your kitchen. Move over glossy, polished surfaces. Texture is in and tiles are king. Cost effective, easy to clean and with endless colours, pattern and shapes to choose from, tiles are making a resurgence with intricate details and patterns continuing to be on trend in 2018. Keep in mind when choosing your tiles, the smaller the tile, the harder to keep clean (grout especially), so if you’re looking for something a little lower maintenance opt for larger tiles or a grout-free finish. One particular grout-free option that offers more than just beauty is the mirrored splashback. With both tinted or untinted options available, a mirrored splashback will immediately make your space look larger and brighter thanks to its reflective surface. The ability to match your tint to your interiors adds to the overall cohesiveness of your kitchen, and the easy-to-clean surface means it’s a favourite amongst many homeowners. On the other end of the maintenance spectrum, marble is without doubt a material that brings a distinct level of style, sophistication and opulence to any room it appears in. While a beautiful choice, like any natural stone, marble is soft and porous in nature meaning it easily absorbs liquid which easily lead to staining. While using a high quality natural stone sealer will help protect your marble, it’s not a set and forget option. Marble will require ongoing care to ensure it is best protected and maintains it’s beautiful appearance. If you love the look of marble but don’t feel the need to use the real deal, opt for faux marble options such as Caesar stone or Silestone, both still visually attractive but representing a more cost-effective option. 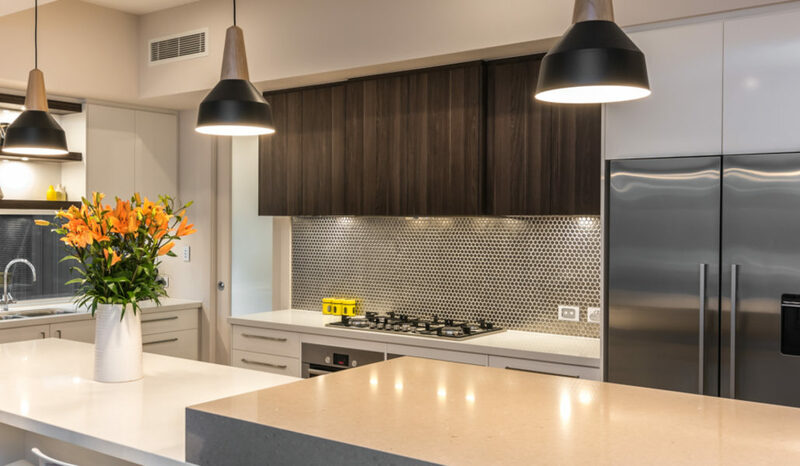 Call Precision Homes on 08 8268 1400 or book in online, for a consultation with one of our team to start the process of creating a home as individual as you are.